Book #2. Am I ever glad that I waited for a few of these titles to be printed BEFORE starting this series. I was able to dive right into Rebel Spring after reading Falling Kingdoms and it was TOTALLY worthwhile. 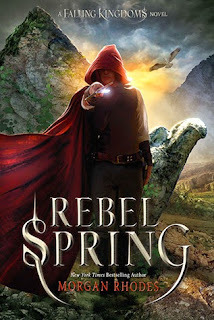 So Rebel Spring is much darker and much more involved than its predecessor. You will not have to worry about second book suckitis here because there is plenty of action happening. What you can look forward to are more unexpected deaths in this book. King Gaius flexes his power and ruthlessness over the Princess under the guise of Magnus and Cleo's romance. It is all a farce of course but the two young people do have a spark, a connection that binds them in the most unusual way. They both have a hatred of the king and I am very eager to see how this ignites. Magnus fails to inspire me as a prince as he lacks the ability to stand up to his tyrant father. Nor does he seem particularly clever in outwitting his father in playing at his own game. I think he would be a less ruthless ruler and more kind to the people of the three lands but has he really learned anything about ruling a kingdom from dear old Dad? With Cleo, they could make a formidable pair. It makes me wonder if he will come into his strengths later because he does FEEL guilt and remorse over his actions and those of his father. He also takes action to prevent unnecessary circumstances (Mira and Thanos). Plus, he DID keep Nic alive after recognizing that he had saved Magnus' life from Cleo. Last spoiler - Chapter 30 - WHAT???!! The hot bachelor prince is gay??? So my take on Book #2 is to obviously read it if you have finished Book #1 but be prepared for lots of action and more deaths. I wholeheartedly enjoyed it and am rooting for Book #3. Bring on Gathering Darkness! !